SKU: N/A. Category: Robert Taylor. Part I of the Band of Brothers portfolio. 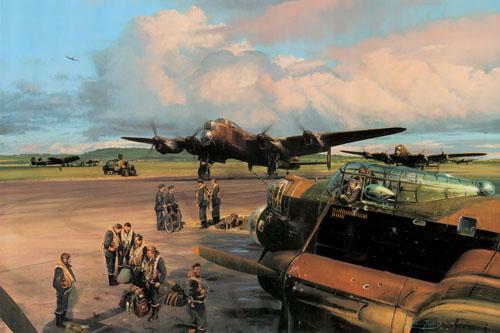 The print shows S for Sugar on the morning of 27th April, 1944 after her 95th sortie – a raid on the ball-bearing factory at Schweinfurt. 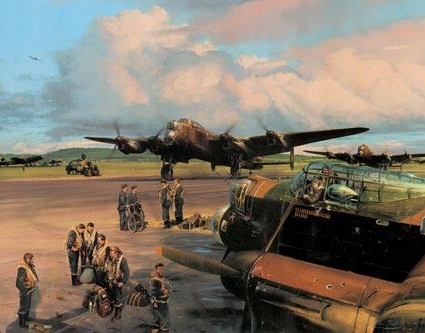 As the battle-scarred bomber taxies in at RAF Waddington, other 467 Squadron Lancasters follow, heading for their dispersal points. Already the weary crews begin their informal debriefing. By the war’s end this trusty bomber had completed no fewer than 137 operations over enemy territory, bringing her crew home every time. 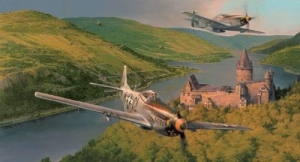 Colonel Elwyn Righetti the 55th Fighter Group CO in a P51-D Mustang is leading his group along the Rhine gorge near the Castle of Stalbeck, returning to their base at Wormingford in 1945.